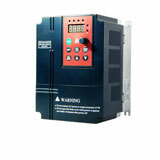 HomeFAQBuy a Variable Frequency Drive or design by self? First, the upsizing of the drive is only applicable to using a 3 phase drive on single phase and has to do with the diode front end. The 3 phase bridge is designed supply input power, and current in 3 phases and now you will only has 1. So the diodes are note sized for that-thus most of the time you have to derate the variable frequency drive from its rated output. You can turn a 3 phase motor into a single phase machine by using a capacitor to shift phases. Performance is not good but it will run. It is not common and the capacitors are not cheap either. Making your own converter would be a good project. It could be simple without all the control and communication circuits. You will have to deal with motor starting however. You will have to decide on variable voltage or variable frequency, with near constant volts per hz (maybe boost to get starting torque). A cost comparison is hard to make depending on your ingenuity. The intellectual challenge is worth something. Could get an inexpensive 3 phase drive and modify the bridge. With some luck you may find one in need of repair, with a damaged front end for cheap and rework it. The output section would be the same. Finally, you can go 240 or 415 depending on the rating. In one case you will need higher current rated output devices. In the other you will need higher voltage ratings. If you are going to design your own, you will want to pick which ever is cheaper for the rating you want. Availability is important. 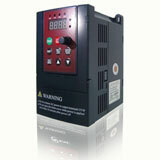 Similarly, if you buy a VFD or get one to rework you may be surprised over which is cheaper. Keep both options open as long as you can. Even you available input power may limit you.